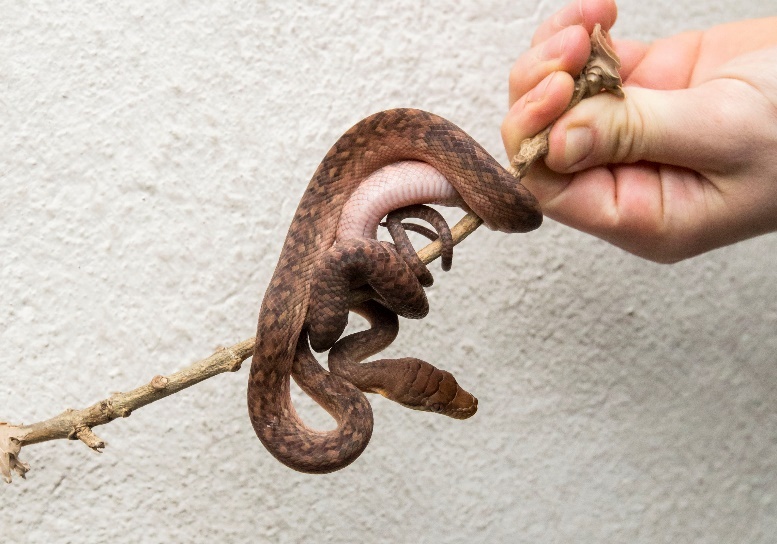 The Oksibil scrub python is one of the several localities of Simalia amethistina that occur on the Island of Papua. 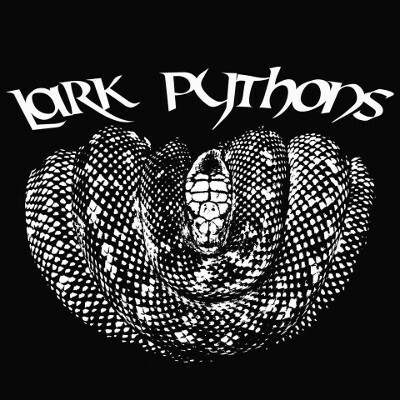 This particular locality occurs in the lower altitudes to the south of the New Guinea Highlands, but is a separate locality to the scrub pythons found at the southern tip of Papua, known as Merauke, or the Northern Barnecks found to the North of the New Guinea Highlands. 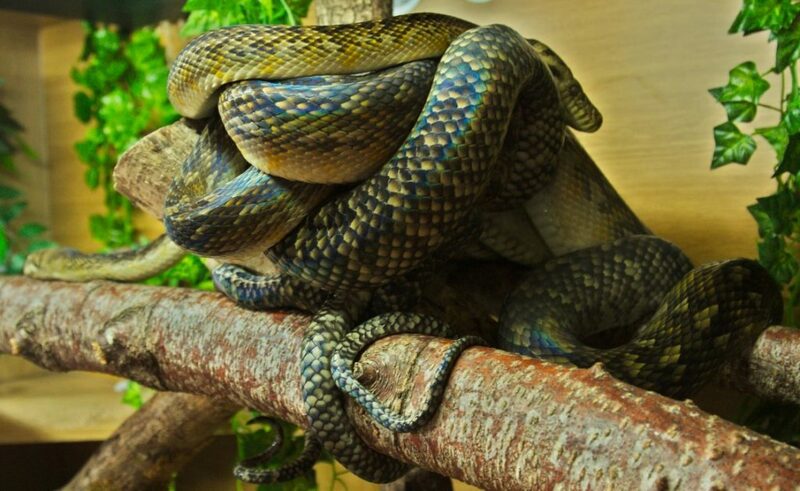 They are known by several names including Highland, Timika or Orange Mountain scrub pythons. The Oksibil scrub python is a large, semi-arboreal snake, which can reach lengths of up to eleven feet. From my experience the females of this locality grow larger, usually between nine to ten feet, being heavier in the body than the males, which reach eight to nine feet but stay far more slender. S. amethistina are a very lean and agile species, and are perfectly adapted for either an arboreal or a terrestrial lifestyle. This locality exhibits a variable background colour of dark to medium brown, with lighter gold, orange or beige scales forming a cryptic pattern. The scutes and the laterals are a pale cream colour. A distinguishing feature of the Oksibil type animals is the bright orange flashes that occur laterally down the anterior part of the body over the paler colour. Oksibil scrubs also share the same neck bars as their Northern Barneck relatives, but they are fainter than the barnecks. The posterior end of the Oksibils tends to be a very cryptic pattern, sometimes bands of dark brown and light gold to beige scales. Breeding enclosures for the pair. Female’s enclosure is to the right. 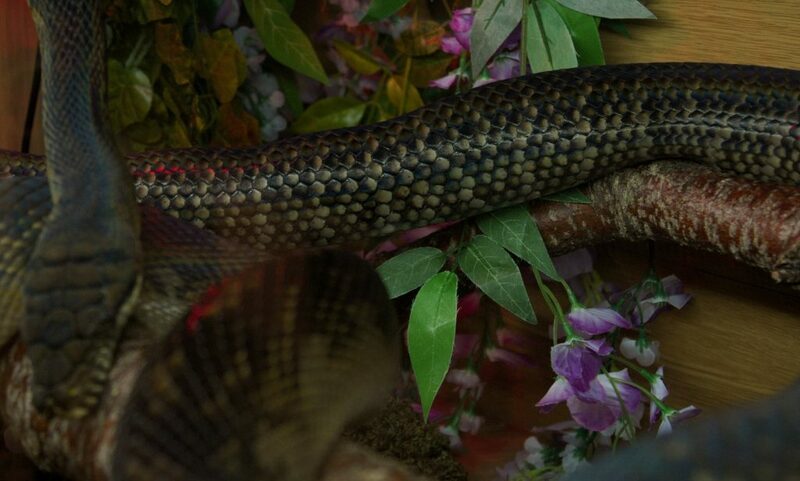 Note “breeding door” between enclosures, behind the fake vine, to the front right of the female’s enclosure. For this pairing we housed the female in a 1.8 x 0.6 x 0.9 meters (6 x 2 x 3 feet) (length x depth x height) enclosure, with the male in an adjoining 1.2 x 0.6 x 0.9 meters (4 x 2 x 3 feet) enclosure. We built a “breeding door” into the enclosures when we built them. This door comprises of two pieces of 2mm Perspex sheet that can be slid out individually or together from between the touching ends of the enclosures, where we cut a matching hole in each of the adjoining sides. These doors are to help reduce the amount of interaction I have with either animal during the introduction and breeding periods, which keeps the stress on the animals to a minimum. Heating is supplied by a direct basking bulb (daylight or infrared) that is positioned at one end of the enclosure above a perch. This provides a direct hotspot (not an ambient) temperature of 30-32 °C (86-90 °F) for eight to ten hours a day. A radiant heat panel is placed approximately six inches away from the basking site, and is set to an ambient temperature of 26 °C (79 °F) for the day and 24 °C (75 °F) for the night time lows throughout spring, summer and autumn. No heating is supplied at the cold side of the enclosure as ambient room temperatures are 22-24 °C (71.5-75 °F). This method of heating gives the animals a wide temperature gradient, which, from my observations is more beneficial for these pythons. They all exhibit the same behaviour of basking until spot temperatures on their bodies reach 32-34 °C (89-93 °F) and then retreating to the cooler side, or for males in particular, roaming around the enclosure. We provide UV access for all our scrub pythons. The UV is supplied by 5% UVB tubes that run a minimum of half the length of the enclosure. They are run on automatic, dimming units that cycle the output of the bulbs up gradually in the morning until they reach peak output and then dim them gradually as night time sets in. UV is supplied for fourteen hours a day over spring, summer and autumn, which is dropped over winter. 45 meters (4 x 2.5 x 1.5 feet) for six months while they underwent a dry run of the breeding period, with one or two introductions being undertaken but no courting or locking attempts observed. After the quarantine period, they were placed in their final enclosures (described above) and left to settle with minimal handling for a year before breeding season. No locking attempts were observed in this breeding season. Finally, in the 2017 season after doing a cooling cycle, we witnessed continual copulations from the start of February until the end of April. In the three months before we halt feeding, we continue to feed the male normally; one moderate sized prey item (small to medium rat) that leaves a small bulge, every 4-6 weeks. We will give the female an extra, small prey item in-between her regular feeds; a medium to large rat every six to eight weeks. We will often offer the female an adult prime quail or an appropriately sized guinea pig to make sure she has sufficient fat reserves for the coming fast. All scrubs should be lean, especially the males. You should be able to see musculature definition and males should not have a rounded appearance. Females going through breeding trials can be slightly more rounded in appearance than sub-adult females. At the start of October we halt feeding for both animals. After the halt in feeding, we allowed four to five weeks, or two defecations, to ensure that the animal’s digestive tracts are fully empty before we start the cooling cycle. The cooling cycle consists of dropping the night time low temperatures by 1 °C (1.8 °F) a week, from 24 °C (75 °F) to 20 °C (68 °F). We also drop the daylight hours and basking hours by one hour a week, from fourteen to ten hours and ten to six hours respectively. Because of our enclosure layout the cool side will be cooler than the night time low temperature set on the thermostat. With the drop in night time temperatures and basking hours, we increase the size of the basking bulb from 60W to 100W to give a warmer basking spot when available. This ensures that the animals can warm up sufficiently with the reduced basking hours. We have observed that the male scrubs will start to deposit sperm plugs in the water bowl after the first two weeks of cooling. Males not being bred continue this behaviour throughout the cool season. With our enclosure design that incorporates a breeding door, it makes introducing the male to the female easier for us and less stressful on the male. We have observed that after the cooling cycle, male scrubs of three years old or over will start to push and tongue-flick against the breeding door if an older female is in the adjoining enclosure. We take this as the cue that the male is sexually active and the female is receptive and remove the breeding doors. This season the male started this behaviour on February 12th. We removed the doors, he moved into the female’s enclosure and started to court her within thirty minutes of going into her enclosure and the first copulation was observed an hour later at 5.30pm. We let the pair cohabitate for the duration of the cool period that lasted from December to the beginning of March. An interesting behaviour that we noted is that this pair would copulate for four to fourteen hours, two to three times over a two day period. They would then separate for four to fourteen days before the male resumed courting. Two to three times a month during the cool period, I would drop the night time lows to 17-18 °C (62-64 °F) for a few hours a night as I was told this helped stimulate the males, however I didn’t notice any significant increase in courting after these drops. I never witnessed a failed courting attempt where the male spurred the female but no copulation followed; all courting attempts were followed by copulation. They would happily bask together without any competition for the basking spot. The warming cycle commenced on March 1st and is the reverse of the cooling cycle. Night time low temperatures are increased by 1 °C (1.8 °F) a week from 20 °C (68 °F) to 24 °C (75 °F). Basking and daylight times are increased one hour a week over the four weeks of the warming cycle. The pair were left cohabiting for the first three weeks of the cycle and continued to copulate. The female started to stay down the cooler end of her enclosure or in the water bowl after as temps were warmed, basking for three or four hours a day maximum. This is consistent with follicle development which started to be evident on March 18th with the female lying with her side partially. The male continued to bask for several hours then cruise around the enclosure. Three weeks after the start of the warming cycle both animals were fed on a very small prey item. We waited until the male moved into his enclosure then replaced the breeding doors and fed the pair separately. We waited two days before we sprayed the animals and enclosures down before we removed the doors. This process was repeated every seven to fourteen days, with the prey size remaining small. The male continued to copulate despite still taking prey. Copulations continued to occur after the night time low temperatures had been brought up to normal temperatures. Large follicles were obvious on the 28th April with the last copulation occurring on the 30th. The pair was separated on the 4th May, fed and two days later the breeding doors removed. The male did not move into the female’s enclosure after the doors were removed, unlike previous times where he moved into the female almost immediately. By 8th May she had definitely started to darken in colour, with the dark part of her patterning being almost black. The female was being fed every seven to fourteen days. Ovulation was witnessed on the 16th May and started around 9-10.00pm and lasted for approximately twenty eight hours. The female was restless and moving around the enclosure and obvious distension from approximately half way to two-thirds down was visible. The female was noticeably dark and her overall demeanour became a lot more defensive. She would now bask for extended periods before moving to a slightly cooler perch or the water bowl. 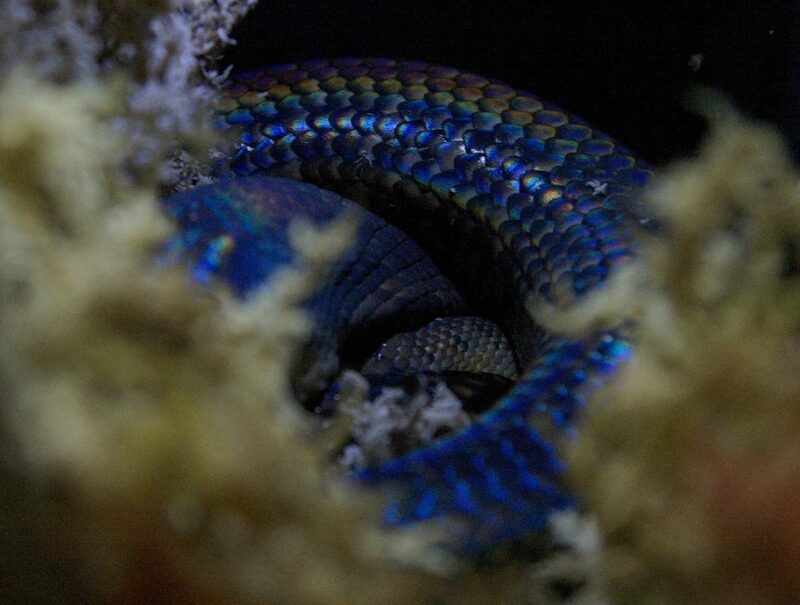 After ovulation the gravid female was definitely more alert and defensive. 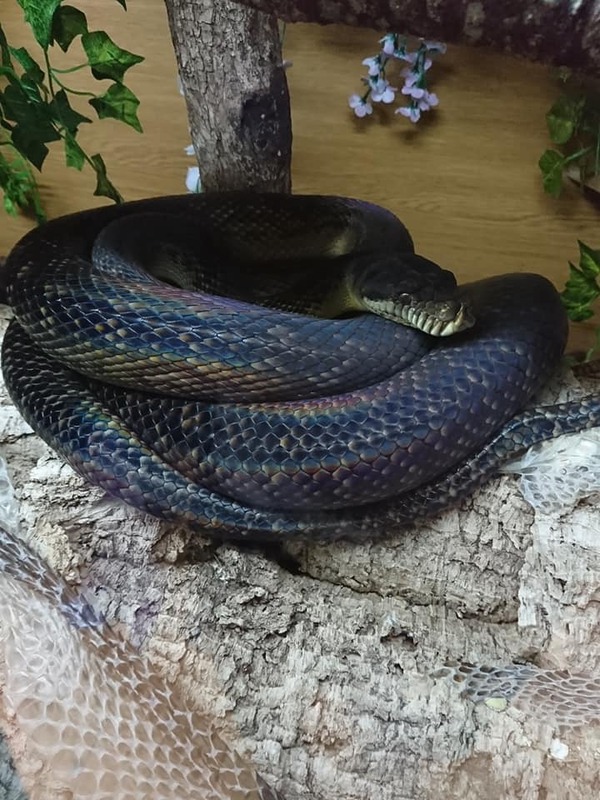 Any time you walked by her enclosure or moved around in front of it, she would come forward and remain in a slightly coiled position. She would alternate between basking for six to eight hours and then spend the rest of the time roaming the enclosure, on the cool shelf or in the water bowl. It is interesting to note that the female continued to take small prey items after her ovulation. On June 12th the female sloughed and her colouration remained dark. 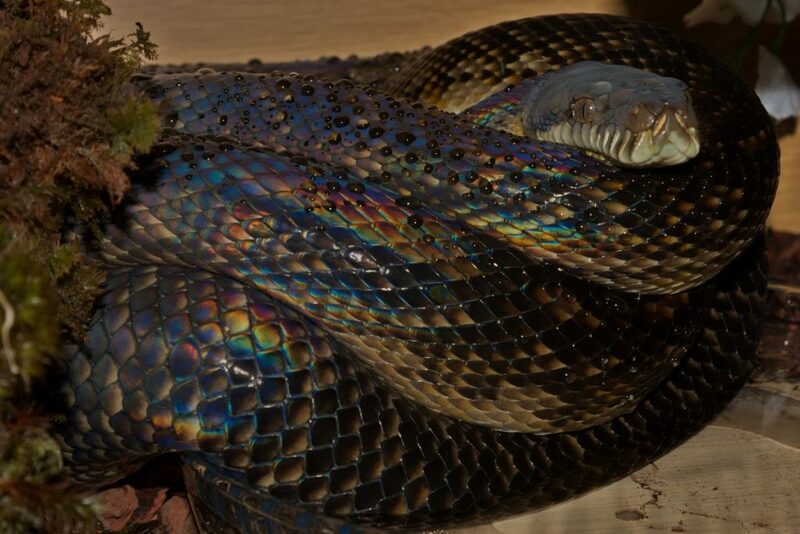 By now, the iridescent sheen that amethistina have was even more pronounced due to how dark the female was. The female proceeded to take a small rat on June 13th, but her strike was much more careful and did not have the same vigour as previous feedings. This was the last time prey was offered due to us not wanting to risk complications with impaction/ becoming egg bound. A nest box was introduced on June 18th and the female moved and coiled inside within hours. The nest consisted of a black plastic box with a lid with clip on handles, with a six inch hole cut in the front. The box was inverted, so the top of the lid was face down onto the enclosure floor. A heat mat, set to 26-27 C on a thermostat, was placed under the nest box to make sure ambient temperatures were high enough in the nest itself. The nest was packed out with damp sphagnum moss. The reason for inverting the box so she lays on the inside of the lid is so when it comes to removing eggs, you don’t have to reach into the box, as you can lift the “bottom” of the box off. From this point on the female would move into the nest box in the early afternoon and stay in the nest all night. In the morning she would soak in the water bowl and by mid morning she would be basking with very loose coils. This behaviour continued until egg deposition. By July 5th obvious distension could be seen when the female moved from the water bowl to the perch, with her posterior half hanging down from the perch. At this point the distension finished about eight to ten inches from the vent. Taken 11th July, note overall dark colour and increase in iridescence. Taken 12th July, note undulations in posterior of female’s body. The female started to lie partially inverted in the nest box on July 10th and started to push excess sphagnum moss out of the entrance or up the inside of the nest box. The female did not bask inverted under the heat bulb. At this time, we could just see the undulations of individual eggs as she moved around the enclosure. On July 14th, the female moved into the nest, but would be constantly shifting her position and rearranging her coils every five to ten minutes. She exited the nest box to bask on the morning of the 15th and returned to the nest at 3pm. As she moved into the nest, we could see obvious eggs near her vent. Taken 14th July, the view inside the nest box. Egg deposition occurred between 7-10 am on the morning of July 16th. We started removal at 9.50am. We were sure that she had finished laying as when we peered through the entrance hole, the female’s head came out. As removing a clutch of eggs from a large python is easier with two people, one person slid a piece of Perspex over the entrance hole and held it in place as the other person carefully lifted the nest box out, keeping it level. We placed the nest box on the floor with a clear working area around the box. We unclipped the latches and lifted the deep part of the tub off the lid so that we could approach her from the side and access the eggs easier. We could see nine fertile looking eggs, not quite in one pile. The female gave two half-hearted lunges. Using a hook, I carefully eased her head away and got one hand under her anterior coils, while my partner placed hands on the eggs to stop them from moving. 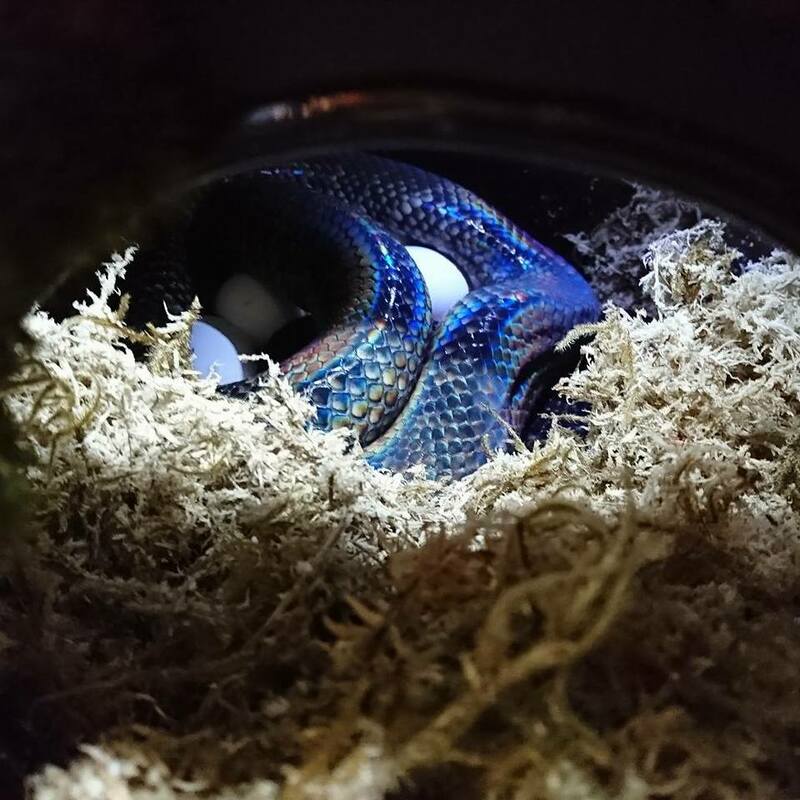 As I removed the female further, my partner removed the eggs which hadn’t fully bound together, and placed them into the incubator. As I was checking her it was obvious that she still had a few eggs left to lay. We placed her into a 65ltr holding tub, and watched her as she laid the remaining three eggs. As each egg was laid, we removed it and placed it into the incubator. The total count was 12 healthy looking eggs, varying slightly in size. Due to this being my first clutch and being anxious to get them in the incubator, I did not weigh or candle the eggs. The female’s enclosure was then thoroughly cleaned with all substrate being removed and the enclosure sprayed down with F10 disinfectant. New substrate was added and the female was reintroduced, where she continued to roam for an hour or so before settling on the basking perch. It is interesting to note that the female hardly lost any condition throughout the breeding trials. After she lay, one could see the fat reserves in the tail were depleted and it had a slightly triangular shape overall. I feel the feeding of a small rat every seven to fourteen day after the warming period contributed to her being in good condition after the clutch. The female was offered a small prey item the day after she lay, which she took without hesitation. She was offered a small prey item ten days later. We then waited three weeks before feeding her with a medium rat. She then resumed our normal six to eight week feeding regime on large rats. After four feeds, the female was back to her normal girth and appearance. The incubator consists of a polystyrene box which is filled with an inch layer of moist vermiculite/perlite mix. A plastic mesh was placed over this and the eggs put onto the mesh and held in place with plastic rods, placed through the mesh into the vermiculite. The incubator was set for 30.5 °C (97 °F) for the first week, and then raised to 31.1-31.6 °C (88-89 °F), the temperature I had been told by an experienced breeder. From talking to other breeders, humidity range for incubation can range between 85%-100%. Our incubator held the humidity at 90%. A few eggs started to dimple after five days so moist sphagnum moss was added around the eggs which helped boost the humidity. Between Day 25-30, one egg became light grey and dimpled and mould formed, however as all eggs were separate, we left the bad egg in. On Day 70 incubation temperatures were dropped to 30.5 °C (97 °F). On the 23rd of September, the first neonate pipped the egg and came two days later. 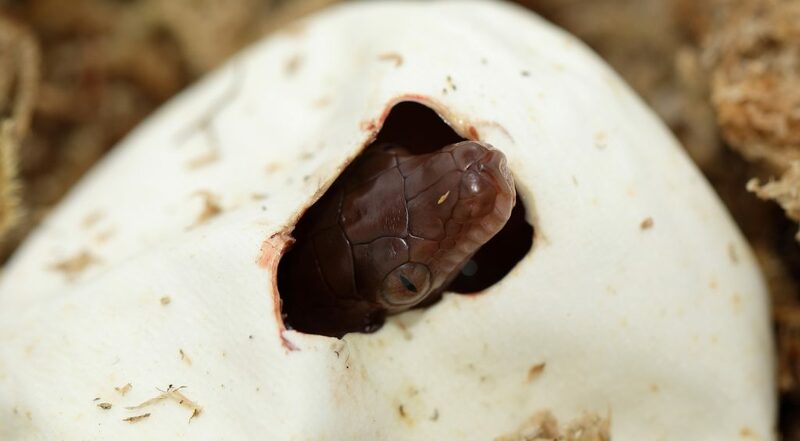 In those two days, 3 more eggs pipped and the 3 neonate scrub pythons came out of the egg over 23-36 hours. 4 off the other eggs had pipped by the 26th, so I made a small incision to join the slits made by the neonate to create a small triangular window, c. 1cm2 in size, and cut a small window in the remaining eggs. Four more babies had emerged by the 29th of September. The last neonate emerged on the 1st October, after having stayed in the egg for 7 days after pipping. The final two neonates were almost fully developed but had unfortunately died in the egg. Example showing small hole cut from where the neonate had pipped the egg. 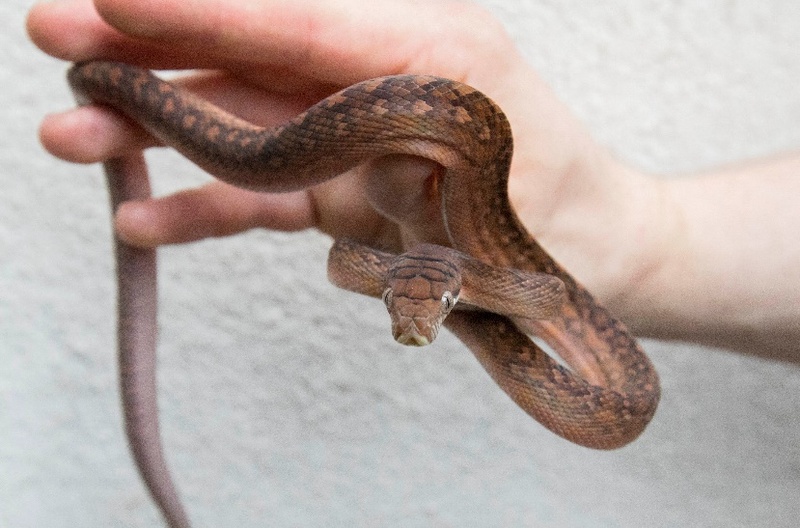 Neonate scrub pythons come out of the egg a brick-red colour. The Highland neonates were on average about 0.3 meters (1 feet) long. Six of the nine neonates looked perfect and healthy, but two neonates, including the last to emerge, had slightly deformed heads. The 4th neonate that hatched was by far the smallest and died on 13th October before it shed. The last neonate had a slight head wobble and was at least half the size of the others, and died on the 22nd October after its first shed. A third neonate (No.1), and the first one to hatch died on 20th December, after having eaten ten times, strike feeding readily. It was a lot smaller and took several weeks longer to have its first shed than the other neonates, despite having eaten before ecdysis. From these results I have concluded that the incubation temperatures I was told were slightly too high for Highland animals. From information given by keepers who have tried maternal incubation, I discovered that they never recorded a temperature of over 30.5 °C (87 °F) in the egg pile. I also believe I made a mistake by raising the eggs off the vermiculite and they may have not retained as much moisture as needed possibly causing the early hatch date. Moving forward from this I will be trying any further clutches at a maximum of 30.5 °C (87 °F) with eggs directly on vermiculite, or possibly try maternal incubation. The neonates were housed very simply in 9l tubs with two perches at different levels and a hide located on the warm side, and the water bowl with some sphagnum moss surrounding the water bowl on the cooler side of the enclosure. Until the neonates had their first shed, they spent most of the time buried in the moss, which was taken from the incubator. Feeding trials began after each animal had its first shed. Unscented mouse fuzzies/ fluffs were offered for first time, except for the neonates No.1 and No.7, which were offered mouse pinks at first due to being smaller than the others, which both struck fed readily. All prey was warmed so it was hot to the touch. No.8 alternated between drop and strike feeding. After its third feed, No.8 went for a month refusing either unscented or scented mice, either drop or striking, no matter how warm the prey item was or how much I irritated it with the prey. Neonate No.5 refused all prey offered in the 9L tub, either scented or unscented. I placed it into a 1L tub with no furnishings and offered a variety of unscented and scented prey. It drop fed on a rat pup but since refused all prey by time of writing. Live prey will be offered and if that is unsuccessful, it will be assist fed. It is important to note that the neonate has not lost any condition, size, or appears to look emaciated. The only notable difference was the amount of contrast in the pattern. Whereas all other feeding neonates had developed contrasting colours, No.5 had very faint pattern showing. On 24th December I moved the four best feeding neonates into our hatchling enclosure. Each enclosure measures 30cmx45cmx45cm (lxdxh). All struck fed readily without hesitation the same day. I moved No.8 into a hatchling enclosure as an experiment to see if started to feed more readily and it struck fed on two consecutive occasions by the time of writing. Below is a table of detailing how each of the surviving offspring fed, and what they fed on. To start with I fed them with a few more frequent meals to make sure they were strong enough and due to conversations with more experienced people that told me there is an abundance of prey in the wild when these animals hatch and the young often gorge themselves on any available prey.